How not to run a business (Part 10.2) — Case Study: Trust | Random Thoughts - Randocity! A business is as good as the trust it practices. Trust is a crucial element in gaining new business. If prospects cannot trust you or what you offer, trust that your business is genuinely there to help your customer, trust that you will provide a high quality service, your business will not succeed. Trust is mission critical to business success. Let’s explore. To visually get the point across, H+ uploaded some CG representations of what the finished product might look like… including this video…. By Day 3 of this Kickstarter project, the project had already been funded the amount of $200k CAD. So here’s where things get a little dicey with both this project and Kickstarter when complaints begin to roll in. At the end, the Holus project raised $297,790 CAD. Some sites are already asking if the Holus is the most expensive scam in Kickstarter history. Reddit readers state these grievances of the Holus device. 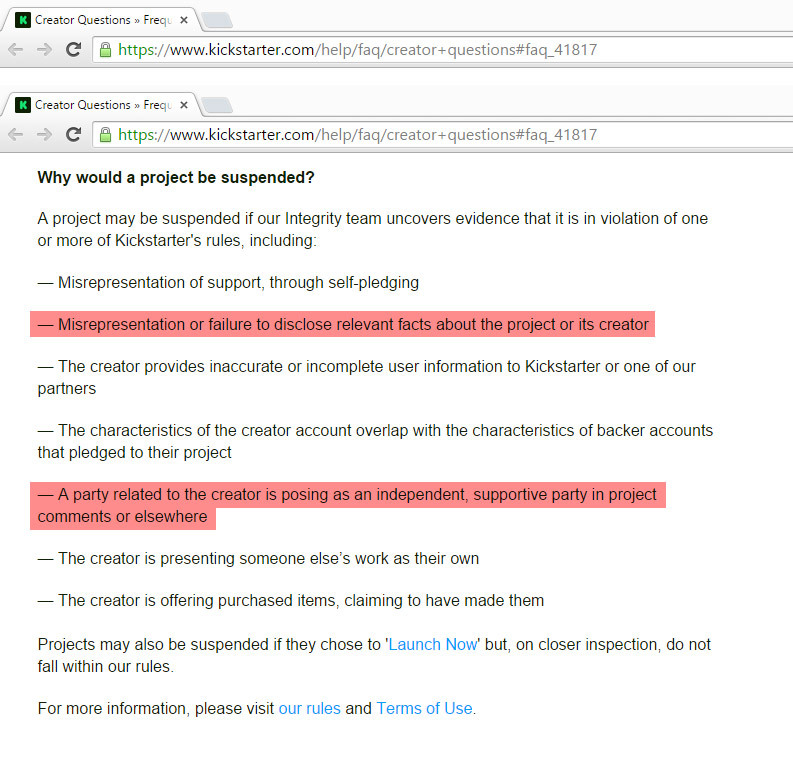 Kickstarter’s rules are clear on misrepresentation. In the above video, it is clearly shown that as the camera moves, so does the 3D of the imagery. With Pepper’s Ghost and a flat screen, this is not possible which misrepresents the capabilities of this device. In other words, Kickstarter doesn’t allow realistic 3D rendered concept photos or videos as part of the project. Including photos of the prototype or drawings of the concept is perfectly fine. However, 3D realistic images depicting a concept are not acceptable and Kickstarter’s rules prohibit the use of such imagery. We all know what these are. They’re basically your flat screen TV with shutter glasses. They’re cumbersome to use, give you headaches and, in general, are mostly a novelty. Yet, this is the state of 3D displays in 2015. No, we do not yet have floating displays such as what’s shown in Minority Report or Avatar. These displays, if even possible, are years away from becoming reality. Yet, here we are on Kickstarter with a small company claiming they’re about to produce a 3D Holographic display. Frankly, it’s not possible. What Holus offers is no better than Pepper’s Ghost. Pepper’s Ghost is a technology that dates back to 1862 and is named after John Henry Pepper who discovered the illusion. A Pepper’s Ghost display has no relationship to holograms or holography, further misrepresenting the display. What Holus offers is a flat screen reflected off of a transparent surface. Because the screen located in the roof of the cabinet is flat, it’s definitely not 3D (without using glasses). Worse, there are already devices like this available on Amazon right now for the iPhone for $10.99. Visit Amazon and compare. Whether the H+ folks intended to deceive or were naïve about what they could show on Kickstarter, it doesn’t really matter from a fraud management perspective. The listing violated Kickstarter’s rules. Yet, Kickstarter did nothing to stop or prevent this listing from continuing. In fact, it seems that Kickstarter even awarded the Holus Kickstarter Project as a staff pick at some point. When this listing was brought to Kickstarter’s attention for misrepresentation, they ignored the warnings and allowed the project to fund anyway. This is not the type of diatribe I expect to hear from a CEO. CEO’s are the top agent of the company. They are the person who investigates wrongdoing and the person who puts a stop to it. No where above did Yancey even mention investigation, taking the strictest action or in doing anything to prevent such an occurrence in the future. Sure, they requested the prohibited content removal, but only after the project was already mostly funded. Kickstarter also didn’t apparently require full disclosure of this content removal to the backers. …DELETED the embarrassing questions asked in the project comments (see screenshots). When Kickstarter deletes comments that could help backers make informed decisions, that ultimately means that Kickstarter no longer respects the backers and is in it to make sure the project succeeds whether it’s a real project or not. This also means that Kickstarter is in it for the money they will get from the project rather than protecting backers from fraud. This is a serious breach of trust and one that should resonate to every backer who has ever backed a project at Kickstarter. There were probably even more behaviors not documented here, but these are enough to show that even though Kickstarter was made aware of the project early in its life, Kickstarter ignored it all and even colluded in making sure the project appeared to be legitimate. Even Yancey’s comment to Joanie attempts to justify the above actions in an obtuse fashion. This is probably one of the biggest business don’ts I’ve ever documented in this series. You don’t do what Kickstarter did. If you establish rules by which the community must follow, then you need to ensure they are enforced regardless of outcome. Even if you stand to lose 20% of that 200k or whatever Kickstarter’s commission is, that is chump change compared to the trust you’ve lost from your community and the possible legal ramifications you face (which I guarantee will cost you more money than any commission you’d make from the fraud). Your community keeps you in business. For this reason, this trust case is worth studying. It’s worth realizing what not to do when running your business. In Kickstarter’s case, the appropriate action would have been to delist and refund all backers before the project closed. Then, request the project owner to relist the project using drawings or other imagery that doesn’t violate Kickstarter’s terms… instead of silently requesting the images be removed without letting the existing backers know… instead of removing key discussions from the project to inform backers of what this project really is… instead of ignoring emails ultimately saying that the project is fraudulent. Fraud is a very real possibility anywhere and everywhere, especially with crowdfunded projects. Fraud is intentional misrepresentation of something. It’s against the law in the US and the US government investigates and takes legal action against those who commit fraud against buyers. Allowing fraud to exist on your own web service and then doing nothing about it once you become aware is collusion and makes your business as much liable as the person who set up the fraudulent listing in the first place. The one thing you cannot know is intent and intent is the difference between innocent misrepresentation and outright fraud. However, to the government, intent doesn’t matter, only the outcome. As a business, you must error on the side of caution and assume the intent is intentional misrepresentation, which means taking the strictest action possible and forcibly removing the offensive content from your site. If your business cannot protect its own customer, then no one will and you’ve lost your customer’s trust. They trust you to be their advocate against thieves, scams and fraud when they are using your service. When you fail at protecting your customer from fraud, your company has failed. Were someone to bring legal action against Kickstarter and H+ for the alleged fraud of this project, there is definitely enough evidence that Kickstarter could be held liable and culpable in this activity. Once you establish business rules by which your clients must abide, you need to absolutely enforce those rules by the strictest of actions in every case. If you allow even one client to slide by the rules, your business could end up in court. If you are on the other end of a Kickstarter project and you choose not to deliver on your backer rewards, the US Government will come after you. Fraud is a federal crime and can lead your business into a lot of federal legal problems. Ed Nash found this out the hard way when his company, Altius Management, failed to deliver the $25k Kickstarted funded Asylum card game in 2012. Failure to provide the necessary level of trust through enforcement of your rules could lead your business into bankruptcy. In this case, Kickstarter’s woes are just starting. How this all ends for Kickstarter is yet to be known, but it’s probably not going to end well. How this ends for H+ and the Holus device is yet to be seen, but delivering a Pepper’s Ghost to backers will likely lead to outrage.